2/15/2011: The unveiling of the Harrisburg Blueprints Project Reclaiming Historic Harrisburg, Augusta, Georgia was held. This project was a year-long endeavor by the Georgia Conservancy in collaboration with Georgia Tech graduate students in architecture, landscape design, urban planning and engineering with Georgia Tech oversight faculty. Augusta Tomorrow and the Augusta Canal Authority were instrumental in bringing the Georgia Conservancy’s blueprints project to Augusta. Working within the structure of the 2009 Urban Area Master Plan, the final report outlined actual recommendations for completing projects as presented in the 2009 Master Plan, The Westobou Vision. 3/2/2011: The Augusta Housing and Community Development Department announced the sale of the first home in Heritage Pine, the City’s flagship development in the overall revitalization of Laney Walker/Bethlehem neighborhoods. 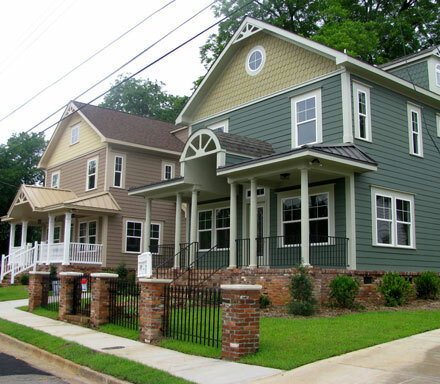 Residential development for this area in downtown Augusta was a priority in the 2009 Master Plan, The Westobou Vision. 3/15/2011: The Downtown Development Authority and Mayor Copenhaver cut the ribbon and unveiled the new stage and other improvements on the 8th Street Plaza at the Riverwalk. The completed project, implemented by the Downtown Development Authority, included a new covered stage with amenities, new swings, picnic tables and landscaping. 4/4/2011: The Augusta Tomorrow Gateways Corridors Implementation Team unveiled beautification of medians and intersections on Wheeler Road from I-20 to I-520. This team undertook the beautification with private funding. The City of Augusta assisted by supplying water to the medians for irrigation. 8/9/2011: The grand opening of The Salvation Army’s Kroc Center at the intersection of Broad Street and Eve Street was held. 10/25/2011: The grand Opening of the Legacy at Walton Oaks Phase I for seniors took place. 11/2011: Harrisburg Turn Back the Block sold their first home.